Mike Cowling has been coming to the GrappleThons I run in Bristol for several years now. I first met him in 2013 when we were raising money for RapeCrisis (he's on the far left here), then again at last year's event for Equality Now (second from right on the bottom row). 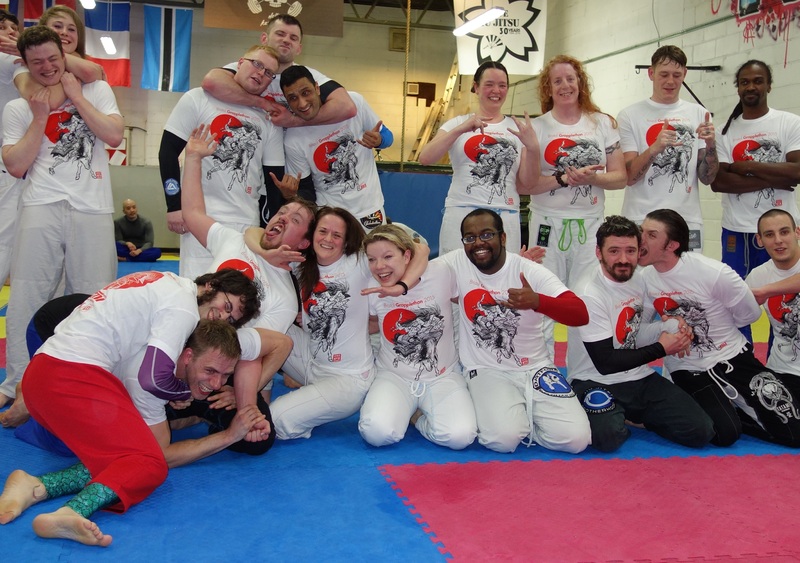 He was part of the dedicated twenty-hour crew this year too, but in 2016 went the extra mile by deciding to host a twenty-four hour GrappleThon himself a few weeks later, also supporting One25. Thanks to Mike and his team, the total for One25 has had a considerable boost. Along with a big donation from BrisDoc among others, it means that at the time of writing the JustGiving total is over £5,000, which jumps up to over £6,000 when you add in gift aid. That's the second highest total we've ever managed: well done to all the fundraisers! It's the second GrappleThon Mike has done at the school, having run a smaller event as part of ROLLforROWW late last year. That was squeezed into the side mats as he fit it around the school schedule. Mike also sent over pictures on the hour for the GrappleThon Instagram. I popped in briefly on my way through London, but didn't take part as I had a fresh tattoo healing on my arm. This time around, I could stay much longer and actually take part. Mike kicked things off at 08:30am, sending over a few pics on Facebook like last time. I headed down to London in the afternoon (meeting up with an old friend I haven't seen in years, which was cool: we wandered round the National Gallery chatting), dropping off a banner and collection box afterwards at about 6pm. After a delicious meal of top notch Turkish food with my father at Babaji, I was finally ready to stay for the long haul from around 10pm through to the end at 08:30am on Sunday. I also played around with the material I'd learned earlier on Saturday at RGA Bucks, throwing up a few reverse triangles, as well as attempting that worm guard sweep Kev showed me. The main issue with that was tempting them to stand up enough that I could bring the lapel behind the leg. I think I need to swing out more to get the necessary space, but I'll keep playing with it. I went for lots of armbars too. With the armbar grip break I learned from Matt H a while back, I wasn't getting low enough on the arm to generate leverage. That could mean my initial grip is too high, I'll need to practice it some more at open mat. I should get behind their arm better too, blocking them with my body. Saulo has a good video on that I want to rewatch.